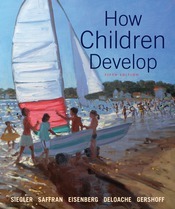 How Children Develop has established itself as the topically organized textbook teachers and researchers trust for the most up-to-date perspectives on child and adolescent development. The authors, each a well-known scientist and educator—have earned that trust by introducing core concepts and impactful discoveries with an unparalleled integration of theory, cultural research, and applications, all in a style that is authoritative yet immediately understandable and relevant to students. New media option—Achieve Read & Practice, combining a complete eBook with LearningCurve adaptive quizzing. For more, see New to this Edition.